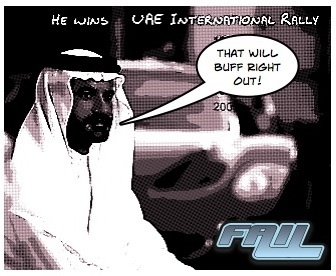 Middle Eastern Rally Champion Mohammed Ben Sulayem got his first and surely last ever ride in a Renault R28 F1 car and managed to produce something certain to be included in the annals of FAIL. 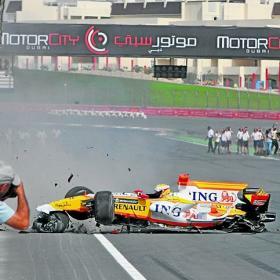 He was drag racing a Ford GT driven by Romain Grosjean who narrowly escaped being smashed into the pit wall. UPDATE: Newest video from Axis reader Dan Frawley who was there!! ! Did you notice how quickly the safety car was rolling versus the time it took to deploy in Melbourne! And did you notice that he didn't feather the throttle at ALL. He just stood on it and expected it to stick... IDIOT. Look a bit down in the comments to read about the way it happened and why. Anyone got pix of the aftermath? To be expected to be honost..
hey guys, I got a better view than this other footage, plus some of the pre-race stuff and crash in slo-mo check it out. You will notice from the first vids that we were actually standing exactly where the R28 hit the wall, glad I wasn't there! better footage from my seat!! DIRKA DIRKA MOHAMMED JIHAD DIRKA! MOHAMMED MOHAMMED REVLIMITER DIRKA CRASH! That was not an R28, it was just a tarted up Enzo! CW (JNM)who posted on Thursday, April 09, 2009 5:11:00 PM. Perhaps you should actually read the official french accident report rather than repeating slanderous comments you read on the web. The aircraft in question was undergoing a runup test by an airbus employee under the supervision of an airbus test pilot. There was one UAE representative on the flight deck but he had no role in the accident. There were two main causes: 1) no chocks were used to hold the aircraft’s wheels in place during the test. 2) All four engines were brought to full power to test one leaky engine. Procedures required the use of chocks and running up two engines - the one leaking and one on the other wing (to prevent torquing and yawing of the fuselage). These two procedures had been frequently ignored by all Airbus technicians at the test center for some time.